A short while ago our team released a stable version of Nebular. Nebular is an Angular library that simplifies complex rich UI applications development. It consists of the following modules: Theme, Authentication, and Security. During the multiple release candidates, we’ve experienced some challenges, and I want to tell you about the most interesting ones. As you know, it’s much easier to build user interfaces using component libraries. One of the vital parts of these libraries is floating components — components which are rendered over the other components and may overlap them, such as Dialogs, Context Menus, Toasts, Tooltips, etc. Nebular library is not an exclusion and requires such components too. We were satisfied with the results and started building the rest of the components based on our Popover implementation. It was fine during the first steps but going further we figured out that it has some limitations that we haven’t thought of initially. It was good for rendering floating panels around the host element like tooltips and context menus, but unfortunately, it wasn’t so successful at rendering global ones such as Toasts and Dialogs. At this point, we came to the understanding that the solution required is extensive and its implementation is going to be time-consuming. That’s why we started looking for third-party alternatives rather than building it from scratch. 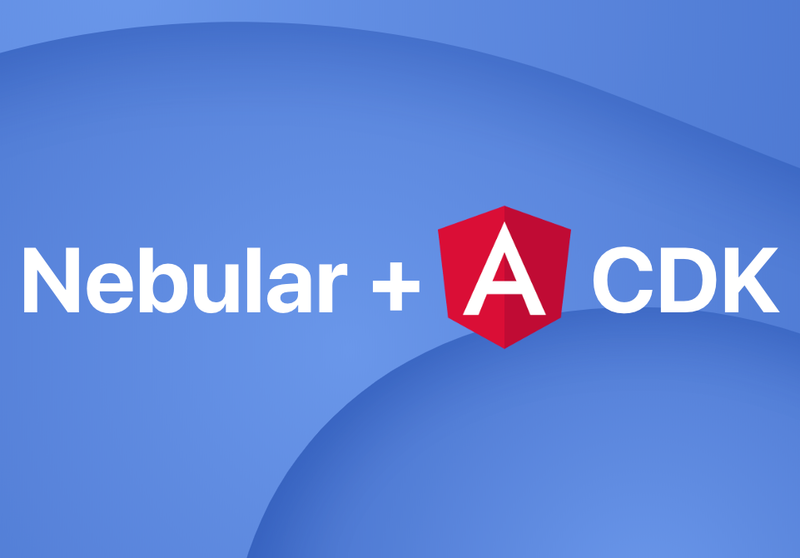 We were aware that Angular provides a component development kit (CDK), so obviously, we decided to look there first. It turns out that it has a lot of basic concepts that are very useful for our cases. Let me explain which of them helped us the most. Have you ever faced the situation when your dropdown is cut off by some parent element with overflow: hidden? Well, it is a quite common issue that we can only resolve by rendering the component somewhere at the top of the document tree, for example right after the <body> opening tag, and position the element as absolute. This is a similar issue we were trying to resolve here in Nebular. At first, we implemented a custom solution. Nebular has a root component that wraps all the entire app. This root component has the capability to render components dynamically before the rest content using ComponentFactoryResolver provided by Angular’s core module. But, by having the CDK in place we were able to resolve it much more elegantly, by utilizing the Portals & Overlays concept. Let’s have a look. The Overlay, in its turn, is an implementation of the PortalOutlet. The key point is that it renders the provided Portal as floating content somewhere on the page. Plus it supports position strategies so that we can describe how the content is placed in the document. The last thing left to get our tooltip ready is to add some code that will show/hide the tooltip as a reaction on the user interaction. And this is where Overlay Triggers come in play. For our use cases, we developed the following implementations: ClickTriggerStrategy, HintTriggerStrategy and FocusTriggerStrategy. Show event will be fired if a user starts to move the mouse over the host element, and hide will be fired when moving the mouse out of the host element. Easy as that. The rest of the trigger strategies are implemented in a similar way. Floating components just register the required trigger strategy and show/hide as a reaction to trigger events. Accessibility is a vital part of any modern web app. And Nebular is no exception. During the development of the Dialog component, we faced the following accessibility challenges: when a user opens a dialog by clicking on some button, the browser focus remains on the button. That means if you press space multiple times, you will create more dialogs. This definitely is not good. When your operating system shows a confirmation alert you just press the enter to confirm it. You don’t need to move the mouse or use tab to focus the OK button. The same behavior has to be applied to the dialog. The focus has to be moved to the first focusable element in the created dialog. As you can see, it has now become quite easy to trap the focus inside component and then release it when the component has been destroyed. This behavior is required for interactive components that may appear on the page and then disappear after a user’s interaction. One of the features of Nebular is the ability to be rendered in another application as an embedded app. For example, as a part of some other Angular or even non-Angular app. That’s why scroll handling and app measuring have to be done on the application container level and not at window level. Unfortunately, Angular CDK services such as ScrollDispatcher and ViewportRuler measure everything at window level. Luckily, there is no problem with providing custom implementations, which were very helpful in our case. As you can see, Angular CDK has quite good extensibility thanks to the dependency injection. To recap, I have to say that the integration of Angular CDK was a very good investment. It saved us a considerable amount of time and gave us the capability to stop reinventing the wheel and concentrate fully on the development of components and Nebular-specific features. Moreover, Angular CDK expands easily enough, which means we can adapt it for our needs.